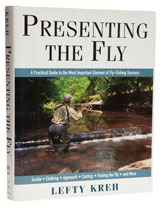 Lefty Kreh has taught fly fishing all his life and this book is a very successful attempt to put his experience into print. Lefty's theme is that presentation is the most important part of fly fishing, more so than choosing the correct pattern, and he includes the clothes the angler wears, the way his tackle is set up, how he approaches the fish, the direction of approach, wind, sun, cover and I couldn’t tell you how much else in this fat volume. Just about every technique gets covered, most in great detail and there are twenty pages on retrieving the fly alone. Though much of the book is about trout, there are sections on bass, pike, stripers, bonefish, tarpon, sharks and ‘cuda, so you can always dream. Books like this generally fail because they attempt to cover too much ground in too little space, or because the author lacks sufficient all-round experience to write about such a huge subject. Lefty Kreh is one of the few fishermen who could do such an enormous subject justice and he doesn’t disappoint. In good condition this book is now trading at up to twice its original cover price.